Part 1 of 4 Winter/Spring 2019 Comedy Night Series! Enjoy a romantic date night out with your beau and some laughs with good old fashion comedy, beer, and food! 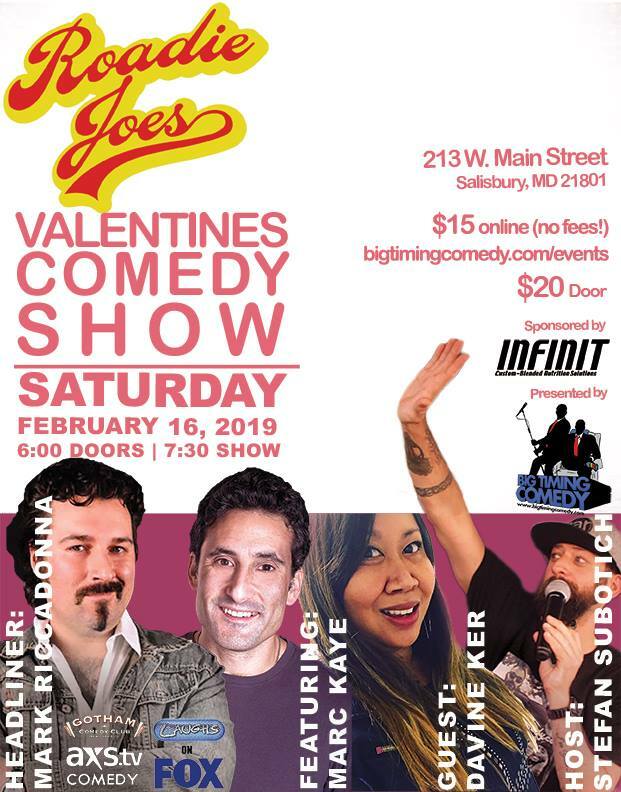 So come out and support eastern shore local business Eric Jolicoeur and Baltimore native Stefan Subotich of Big Timing Comedy and Roadie Joe’s team up for a fun night in down town Salisbury Maryland! Marc doesn’t have a bucket list. As he likes to put it, “I have a Dixie Cup list – I like to keep my expectations low.” Originally having tried stand-up as one of his “Dixie Cup List” items and a way to meet other writers, Marc quickly realized he found a creative outlet for the stories and never-ending thoughts that infiltrate his head on a daily basis, not to mention a cheaper version of therapy. So began a trek that includes stints at Catch a Rising Star, Stress Factory, Comedy Works, Reading Comedy Outlet, Helium and a host of East Coast venues and fundraising events. He has also been heard on podcasts and is a freelance writer who has published for journals, magazines and websites. Marc also is a pianist and songwriter. Marc will spin tales of growing up differently, living under the roof of the most frugal parents in the world and dealing with the insanity of everyday life into a comedic interpretation that will keep you laughing. If you never considered paper plates as “magical” or the virtues of “ergonomic soap”, you will after listening to Marc Kaye! She has performed at The Source Theatre, The DC Arts Center, The Howard Theatre, Arlington Drafthouse, BloomBars in DC, Jammin Java, Sully’s Comedy Club, Baltimore Comedy Factory, DC Improv Comedy Club, Cozzy’s Comedy Club, Magooby’s Joke House, Liberty Laughs Comedy Club, Broadway Comedy Club and Dangerfields Comedy Club in NYC. Davine Ker has shared the stage with the likes of Guy Torry, Todd Bridges, Willie Tyler, Pat Dixon, Jeffrey Gurian, Greer Barnes and Canadian legend Mike MacDonald. She speaks English, French, Cambodian and Comedian very fluently. She was affiliated with Laugh Index Theatre as a house comic, is currently a contributing columnist with Bliss Magazine and is a radio DJ/Host with Urcityradio.com. A humble boy from humble beginnings. Stefan Subotich is a Baltimore Native born in Parkville, MD, otherwise known as the Motherland/ Land of Milk and Honey. He studied locally at Calvert Hall High School, before moving on to the renowned West Virginia University. It was at West Virginia that his education truly blossomed. He met many Rednecks, alcoholics, and generally obese people that loved his trademark wit and charm. He was strongly encouraged there to pursue a career in comedy. His travels later brought him home to the Motherland, where he landed a job as a Bartender at a local watering hole, Souris Saloon. There, he met many yuppies, alcoholics, and generally thin people that loved his trademark wit and charm. He was again strongly encouraged to pursue a career in Comedy. It was at this juncture that he came across Eric Jolicoeur and expressed his strong desire to Eric that he desired a career in comedy and entertainment. The two formed the powerhouse comedy super label BigTimingComedy, and the rest my friends….is history. Stefan enjoys all things Baltimore sports and a nice strong beverage. He excels at all delicious and wicked. So, please, drop him a line on the twitter @bigtimingcomedy, or come out and support his unique brand of highly offensive comedy. I promise, even if you dont laugh (which you will), youll be entertained.